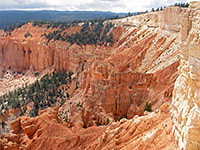 Visitors who drive the full length of the scenic drive in Bryce Canyon National Park to the southernmost overlook at Rainbow Point have a choice of two trails: one is the 8.5 mile loop to Riggs Spring, which is lightly traveled and may require two days to complete, with a night spent at one of three primitive campsites along the way. 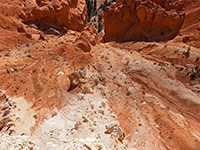 The other is the one mile Bristlecone Loop Trail, a mostly level path that crosses thick forest of spruce and fir to several overlooks of cliffs, canyons and hoodoos along the south end of the Paunsaugunt Plateau. 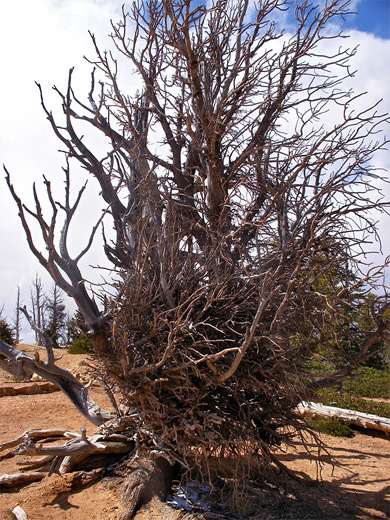 En route are a number of weather-beaten bristlecone pine trees, some nearly 2,000 years old. The path can be combined with the short walk to nearby Yovimpa Point for an easy round trip of 40 minutes or so. The short path to Yovimpa Point begins a little way back down the road from the small parking area at Rainbow Point, at an elevation of 9,110 feet; it crosses a thin belt of trees to the edge of the plateau, ending at a fenced overlook that has fine views southwards over many miles of uninhabited land. The pink cliffs continue a few miles further southwest, forming a graceful pink/orange/white arc in the foreground, though most of the terrain is wooded, undulating, uniformly grey-green in color, and several thousand feet lower in elevation (see 360 degree panorama). On a clear day the vista extends to the Paria River valley, US 89 and the Kaibab Plateau. 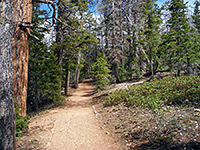 A connecting path close to the rim links with the Bristlecone Trail, which leads through the mixed forest of white fir, Douglas fir and blue spruce to another good viewpoint at the top of the cliffs, a place largely devoid of trees apart from several bristlecone pines. The most prominent is right by the edge, marked by an informative sign, though this particular tree seems to have died sometime in the last few years, after surviving the harsh conditions here for some 16 centuries. The return part of the loop path encounters more bristlecone pines and has views of The Promontory, an isolated pink-sided summit southeast of Rainbow Point. The trail also passes an old log shelter built by the NPS, which as well as providing a place to rest has several informative notices about the life of 19th-century naturalist/philosopher Henry David Thoreau, including some pertinent quotes about the value of solitude. He never visited this location, however. The final quarter mile of the path is through quite dark, dense forest and hence is usually cool and shady, harboring patches of snow that often do not fully melt until late June - the trees welcome such snowdrifts as they keep the soil moist well into the dry seasons of spring/summer. In winter the snow accumulates to depths of 10 feet or more so although the road to Rainbow Point is generally open, the trail may well be inaccessible. There are two junctions along this last section of the path, with the Riggs Spring Trail (east) and Under-the-Rim Trail (northeast).